SINGAPORE — Back in 2003 at the International Istanbul Biennial, the Korean artist Do-Ho Suh presented one of his large-scale fabric installations "Staircase (Installation for Poetic Justice)," a red ethereal fabric staircase suspended from the ceiling and running through two floors without quite reaching the ground. The artist is now revisiting the idea on a smaller scale and in a different medium. Working in residency at the Singapore Tyler Print Institute, Mr. Suh is creating a staircase in red threads laid over paper pulp. "Almost all my fabric pieces are suspended from the ceiling and this accentuates the sense of gravity," he said. "So here, I've tried to find a way to simulate lines that would almost be suspended in space, with thread in pulp and water, because the way the water pushes and pulls the thread on the paper creates these beautiful lines. The staircase connection is a literal one, but in my mind the connection and continuation with my previous installation is dealing with gravity in two-dimensional drawings," the artist, who is based in New York, explained while recently in Singapore. Thread, fabrics and sewing have played an important role in Mr. Suh's site-specific installations which regularly explore the issue of cultural displacement and the relationship between individuality and collectivism. Born in Seoul in 1962, Mr. Suh grew up in an artistic family. His father, Suh Se-ok, was a pivotal figure in Korean modern art for his use of traditional ink painting in an abstract style. In the 1960s, many of Korea's traditional homes were destroyed to make way for modern buildings, but Mr. Suh's parents had a small, traditional scholar's house built of discarded wood from a demolished palace building. This house and its traditional decorative elements have become central to the artist's work as he reflects on his own feelings of cultural displacement and longing after moving to the United States in 1991. Right after his graduation from the Rhode Island School of Design in Providence in 1994, he was living in a noisy apartment in New York when he thought about recreating his quiet Seoul home using translucent organza. "In many ways, this was a pivotal piece in my career because it was one of two or three major pieces that I did right after school," Mr. Suh said. "I first sewed my studio and made some samples of the Korean house." Then he got a grant and was able to realize the full version. Two years later, Mr. Suh was invited to present four works in the Venice Biennale, which brought him international recognition. In "Some/One," he used Korean military dog tags to form a giant imperial robe, and in "Floor," 180,000 fragile plastic figures tightly placed against each other hold up a glass floor. The works reflect on the power and strength of the collective, sometimes at the expense of the individual. "All of my works really come from the same idea. They all deal with space; being an architectural one or a figurative one like your personal space," he said. At the Singapore institute, Mr. Suh has revisited some of his previous themes but also explores some new ones. Several of his new works portray isolated figures with shadowlike forms hovering over them. They are "based on the belief that one is not exactly one" but "many different things — other people's influence, history, different personalities. But you don't see it, it's invisible," he said. The artist is now preparing a fabric installation for the Venice Biennale of Architecture (Aug. 29 to Nov. 21), where he will represent the facade of his brownstone apartment in New York. He's also planning an installation for the 2010 Liverpool Biennial (Sept. 18 to Nov. 18), where he will place a replica of his childhood house in an empty lot with a parachute and the scattered contents of the house. The Liverpool installation continues work on a theme that explores a story Mr. Suh wrote in 1999 that resembles the opening scenes of "The Wizard of Oz." A Korean house is lifted by a tornado over the Pacific, landing in Providence. With a parachute slowing its fall, the house gets stuck in the corner of a brownstone building similar to the one the artist lives in today. In "Fallen Star: Wind of Destiny," (2006), Mr. Suh represented that Korean house atop a tornado of carved Styrofoam and resin, and in "New Beginning," (2006) he showed a large dollhouse-like representation of his 18th-century apartment in Providence with his family's Korean home stuck in the middle of it. Mr. Suh is also working on commissions from two American museums. One is for the Los Angeles County Museum of Art's Korean gallery: an in situ a royal folding screen recreated in clear acrylic resin a section of the palace where the screen initially would have been housed. For his second museum commission, at the Museum of Fine Arts in Houston, he is recreating a traditional Korean gate, but is doing so in a negative space that visitors can walk through. 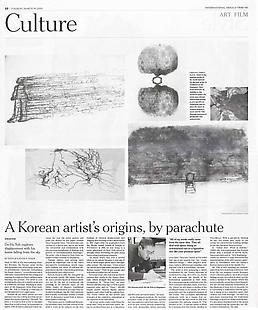 "So here it's also about transporting two traditional buildings in Korea to those institutions; it's also about displacement of the space and transporting the space like my other fabric installation," he said.